But as with almost every food that I have ever come across that is beloved by many and disliked by me, I discovered that the problem was with the versions that I had tasted...not the actual food itself. 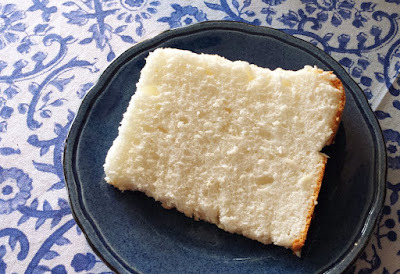 Recently I have found that angel food cake can not only be edible...it can be delectable—tender and light... and with a fleeting sweetness that dissolves so quickly in your mouth that you immediately want to take another bite. Part of the problem with the angel food cakes usually encountered is that almost everyone uses a mix (which are pretty much awful)...or purchases a substandard bakery version (they can always be found in the prepared food sections of the grocery stores in the spring...during the height of strawberry season). I would guess that scratch versions are rare because most people don't bake enough to have a use for a dozen or more egg yolks (angel food cake uses a lot of whites...and no yolks). But the larger impediment probably has to do with having to beat egg whites. Getting them just right can be a bit tricky. 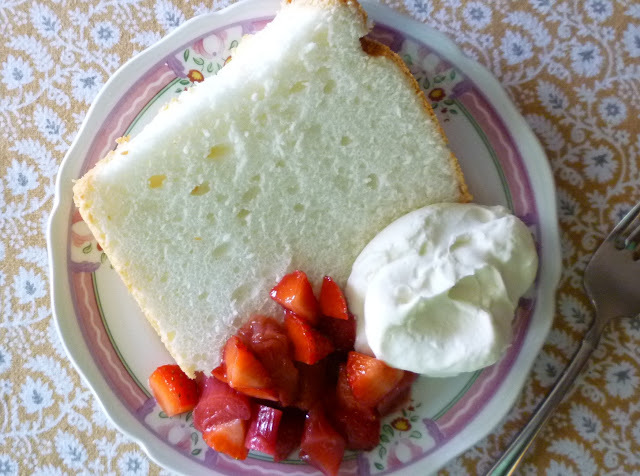 I made my first angel food cake a few years ago at the request of my mother. She wanted one for her Mothers' Day dinner dessert. 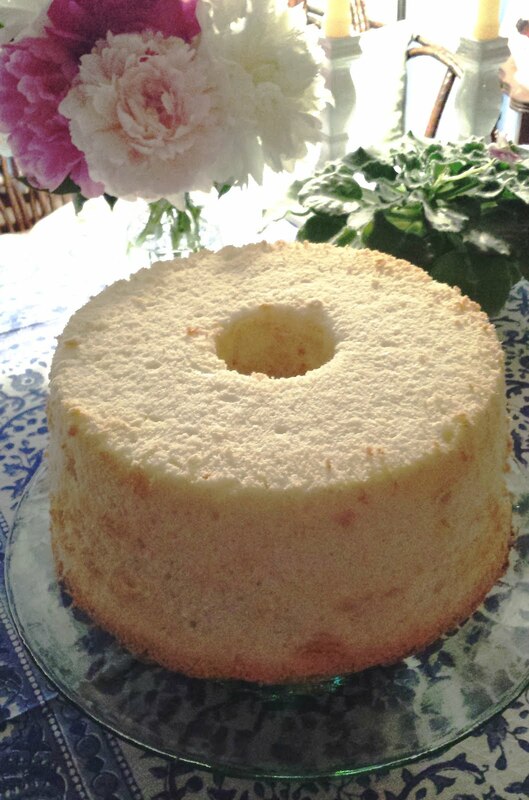 Remembering the angel cakes of my childhood I wasn't very enthused about it, but it was for Mothers' Day.... I began as I always do by looking up a number of recipes. Not surprisingly, I found them all to be fairly similar. 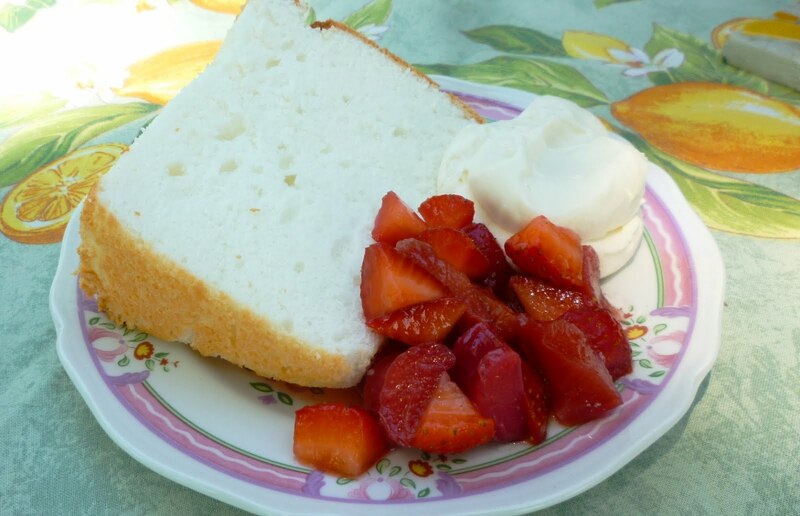 Angel food cake follows a pretty standard formula: The weight of the sugar and whites should be equal. And whatever the weight of these, the flour should weigh a third of that (so, in my recipe the sugar and whites are 15 oz. each, and the flour weighs 5 oz.). 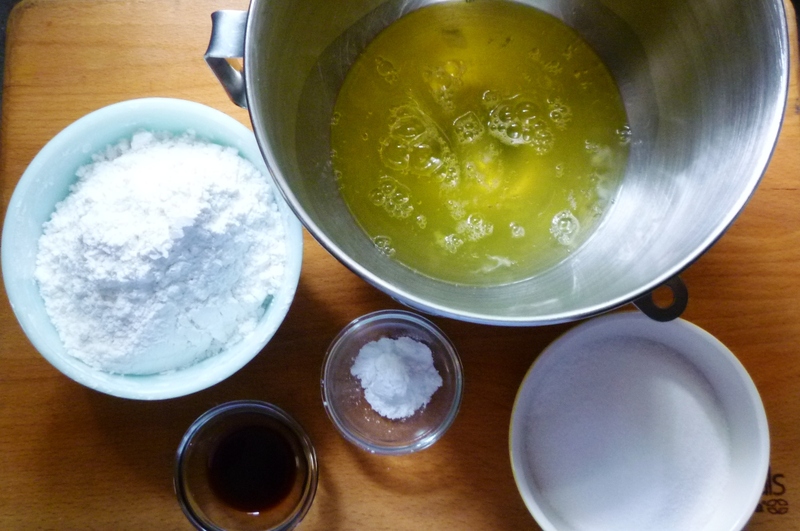 Most recipes also call for cake flour (which should give a nice light, tender result), salt, cream of tartar and vanilla. The mixing method is always some variation of whipping the whites with all (or most) of the sugar and then folding in everything else. You will find recipes that start with all the sugar in the bowl with the whites (this makes the process quite slow, but it also prevents over beating)...and others that use a more traditional approach of adding the sugar gradually to the whites as they are whipped. Sometimes some of the sugar is held back and mixed with the flour and folded in at the end. And, as you can imagine, the method you use is what makes the difference between a light, tender cake...an indifferent cake...and an awful cake. The first few times I made what I felt were fairly indifferent cakes. Not terrible...but nothing to get excited about either. Since everyone is used to marginal angel cakes (or so it seems to me...), mine seemed to go over just fine. 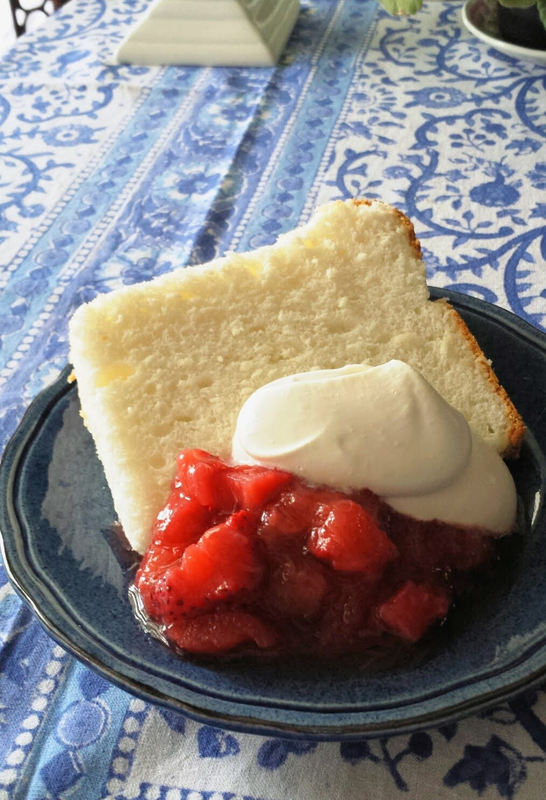 But I still wasn't very happy with it and I continued to read up on angel food cake, altering my recipe a little bit each year. Last year I made one that pleased me very much. I made careful notes but forgot about it until Mothers' Day rolled around again this year. When I made it again this year, I was once again super impressed. I wish I could point to all of the recipes that contributed to my final version...but I can't. There were just so many, some of which I can't even locate at this point. I do know that I relied pretty heavily on Joy of Cooking, an article in Fine Cooking by Flo Braker...and Shirley Corrhier's comments on the topic in her book Bakewise. Mostly what I discovered is that the whites need to be beaten less than you think. Most people are probably over beating the whites (I know that I was). The wording "beat whites until stiff and glossy" (which is what you find in a lot of recipes) is misleading. When it comes to angel food cake, stiff whites are over beaten whites. The finished whites will indeed be glossy...and hold their shape—but they should not be so firm that you have to bang the whisk on the edge of the bowl to get it to release the whites. They should be soft and form what I would call floppy...or droopy...peaks. Flo Braker, in a very good article in Fine Cooking, makes the observation that the goal is to beat the whites to their optimal capacity...not their maximum capacity (i.e. "stiff"). When you are done whipping the whites they should still have a suppleness and elasticity to them. 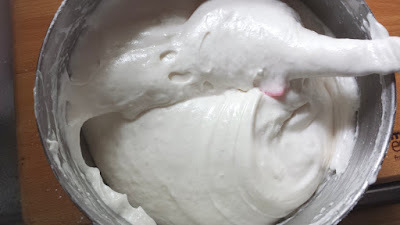 If beaten to just this point—and no further—when the cake is placed in the oven and the beaten whites are subjected to heat, the bubbles formed during the whipping process will be able to continue to expand without bursting.... and will reach their maximum capacity in the oven. If they had already reached their maximum capacity while being whipped, they would still expand in the oven, eventually pop and the cake would collapse (sometimes a lot) and probably toughen. Much is also often made of the folding in of the dry ingredients. The reason for this is that improper folding is inefficient and creates more opportunity for crushing the carefully prepared egg foam. And I agree this is important...but a supple egg foam (see above) is much more forgiving than a firm and stiff egg foam. As long as you are using a rubber spatula, whisk or mesh angel food cake folder...and are using the proper motion you should be fine. used to make her angel food cakes. Finally, make sure you use a large, ungreased 10-inch tube pan for this recipe. My recipe is very large and the cake will come all the way up to the rim of the pan while baking. If your pan is smaller, simply make 2/3 to 4/5 of the recipe. As for the preparation of the pan...it is left ungreased so that the baking cake can adhere to the sides and climb to its full height. Because the pan is ungreased, the golden brown crust will remain in the pan when the cake is tipped out—revealing the beautiful and pristine white crumb of the cake. I'm glad that I have finally made friends with angel food cake...making them is apparently in my DNA. I am told that my great grandmother made an angel food cake that was so good she was able to sell them to bring in a little extra money. The story that has made it to my generation says that she used to sit on the back stairs while she whipped the whites by hand. Amazing. I will not be giving up my stand mixer any time soon....but now that I know how good this cake can be, I will continue the family tradition...hopefully making angel food cake more than just once a year. Sift the cake flour, powdered sugar and salt together and set aside. Place the whites in the bowl of a stand mixer. Using the whisk attachment, run the mixer on medium low until the whites are frothy. Add the cream of tartar. Increase the speed to medium and beat until the bubbles are small and uniform and you can see the trace of the whisk in the egg foam (this will only take a minute or so). Increase the speed to medium high and gradually add the sugar, beating to soft and floppy peaks (a minute or two). DO NOT BEAT TO STIFF PEAKS...the egg foam should fall easily from the beater with a little encouragement (you shouldn't need to bang the whisk against the edge of the bowl). Quickly add the vanilla. Add the dry mix in three additions, sifting over the meringue and folding in. Pour the batter into an ungreased 10-inch tube pan (see note). Run a palate knife through to get rid of any pockets. If you dripped batter on the sides, run a rubber spatula around the edge of the pan. Transfer to a 350° oven and bake until golden, cracked and springy. A skewer will come out clean and an instant read thermometer will register 206°....about 45 minutes. Don't start checking until the cake has been in the oven for at least 35 minutes. Cool upside down (place the cone over a funnel...or wine bottle...or simply upside down on a rack—most pans have three handles/legs around the top edge for just this purpose) for two hours, or until completely cool. Cooling the cake upside down will keep the egg foam bubbles fully extended as the cake cools—they will tend to want to shrink and collapse from the pull of gravity as they cool when the pan is right side up. Remove from the pan by tilting the pan and gently rapping the bottom edge of the pan on the counter, rotating the pan as you do...you may need to run a palate knife around the top to release the top edge first. Release the bottom and inner column in the same way. Note: Shirley Corriher in her book Bakewise suggests rinsing the pan with hot water (just pour it out...don't dry it) right before adding the batter. She likes the way it warms up the pan...and also that it adds some steam to the baking process. I have found that when rinsed with hot water the cake comes out of the pan a bit more easily.